Wear homage to nature and women. Resplendent shawls featuring the elements of nature. 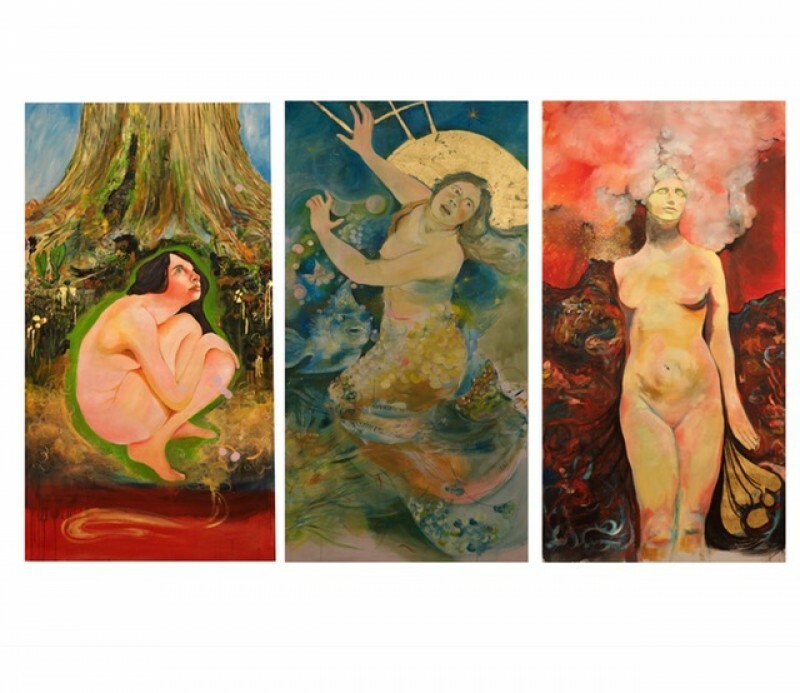 In January 2017 I began painting the original panels of the Elements - water, fire & earth as a homage to women and nature. Since then I have used these images to create unique wearable art, textured wallpaper and textiles for interiors. 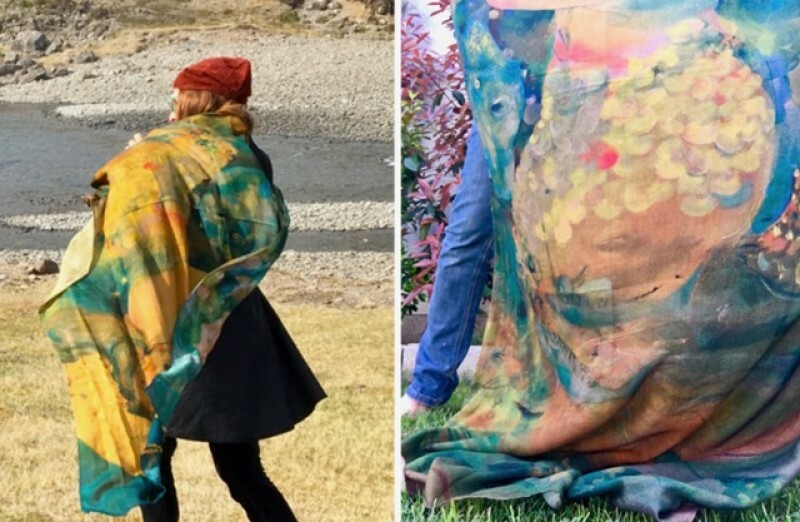 The first 100 shawls of the Mermaid were produced by Fattorseta in Cernobbio Italy and distributed at the Settlement Center and Ljomalind in Iceland. Í janúar 2017 málaði ég upprunalegu verkin af verunum sem eiga rætur í náttúruvættunum vatni, eldi og jörð. Síðan þá hef ég notað þau verk til að skapa einstök klæðileg sjöl, myndskreytt veggfóður og textíl til heimilisnota. Since the production of Siren the Mermaid I've received dozens of requests for the Fire Goddess. The company I order from has increased their minimum order from 50 to 300 pieces. This amount is more than I anticipated qua transport, storage and initial investment. Which is why I am offering a discount to the 1st 20 BULK orders placed. You may choose how many you want from Gaya Mother Earth, Siren the Mermaid or Pele the Fire goddess. It is also possible to order just one shawl. Your orders give me a clear indication of how many and which of these lavish art shawls should be produced. The process of printing and tailoring the shawl takes time. Please allow 2 months turn around time from the end of the campaign. Fattorsetta, has been making scarves since 1953. Frá því sjalið, Hafmeyjan Sirien, fór fyrst á markað hef ég fengið margar fyrirspurnir vegna Eldgyðjunnar Pele. Fyrirtækið sem ég versla við hefur hækkað lágmarksfjölda fyrir fyrstu pöntun úr 50 í 300 stykki. Þessi fjöldi er meiri en ég gerði ráð fyrir auk flutnings, geymslu og fjárfestingar. Þess vegna býð ég aflátt af fyrstu 20 fjölda pöntununum. Hægt er að velja milli Gaya Móður jarðar, Hafmeyjunnar Siren og Eldgyðjunnar Pele. Fattsoretta hefur framleitt trefla síðan 1953. Það að sníða og prenta sjölin tekur tíma. Vinsamlega gerið ráð fyrir tveggja mánaða afgreiðslutíma. Prototypes of the new designs Gaya Mother Earth & Pele The Fire Goddess can be viewed in my studio or on the images provided. These resplendent custom art shawls drape elegantly and are a blend of 45% cotton and 55% viscose, digitally printed and tailored at Fattorseta in Italy. I am a visual artist based in Iceland and have been creating most of my life. I work and exhibit internationally, I have lived and had art studios in the U.S., The Netherlands, Switzerland, Belgium, Italy and Iceland. More of my work can be viewed on my website www.michellebird.com. Fyrstu útgáfur af sjölunum Gaya Móður jörð og Eldgyðjunni Pele er hægt að skoða í vinnustofu minni og á myndunum sem fylgja hér. Þessi ríkulega myndskreyttu sérhönnuðu sjöl falla vel og eru gerð úr blöndu af 45% bómull og 55% viskós. Áþrykkingin er stafræn og sjölin sniðin af Fattorseta á Ítalíu. Ég er myndlistarkona búsett á Íslandi og hef unnið við sköpun mest allt líf mitt. Ég vinn og sýni á alþjóðavettvangi og hef búið og rekið vinnustofur í Bandaríkjunum, Hollandi, Sviss, Belgíu, Ítalíu og Íslandi. Verkin mín má sjá á heimasíðunni www.michellebird.com. This series is a fusion of styles; abstract and figurative, morphing people I know and places I've lived to create my own mythological archetypes in surreal landscapes. I paint on heavy large linen panels which eventually hang loosely, to evoke the feeling of a tapestry. The Café Review Summer Edition A Maine based quarterly journal of art, poetry and reviews.